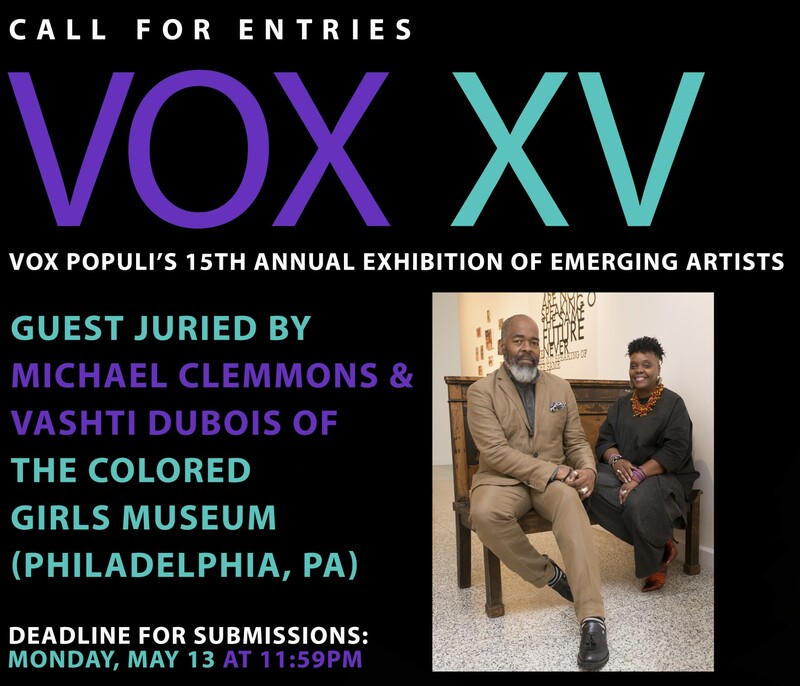 Philadelphia non-profit art gallery and collective Vox Populi is accepting submissions for its 15th Annual Juried Exhibition: VOX XV, guest juried by Michael Clemmons and Vashti DuBois of The Colored Girls Museum (Philadelphia, PA). This exhibition opportunity is particularly meant for local and emerging artists without commercial representation and who push boundaries in terms of form and content within their work. We seek artists who employ alternative methodologies within their practice and want to expose their work to new audiences. Vox Populi is interested in highlighting work in all media that is ambitious, timely and risk-taking. A theme for the resulting exhibition may emerge based on submissions and the interests of guest jurors. The exhibition will take place from July 12 to August 11, 2019 at Vox Populi. The deadline for submissions is Monday, May 13, 2019 at 11:59pm. There is a non-refundable $15 application fee. All fees collected from this open call are used to offset the cost of the exhibition itself, including covering the costs of gallery supplies and equipment, occupancy costs, and juror fees. This is not an artwork-commission or paid exhibition opportunity. Artists should apply with existing work that is easily, inexpensively and safe to be transported/shipped. Accepted artists are also expected to cover the costs of shipping and/or transporting their work to/from the gallery. Vox Populi will provide labor and/or assistance for installing the work, as well as all necessary equipment, including access to audio-visual supplies (projectors, monitors, media-players) and other installation tools/exhibition furniture (pedestals, shelves). In his art practice, Michael Clemmons uses a cultural palette creating mix-media paintings- referencing timeless landscapes, West African and personal iconography – ceramic sculpture and installations. Educated at the University of the Arts, Temple University and The Clay Studio in Philadelphia, his work is represented in collections internationally. With 30 years’ experience in community engagement and project development from inception through implementation he builds and coordinates strategic partnerships, facilitates programming, while advancing the goals of community and mission of the University. Mr. Clemmons is currently the Acting Director of Temple University’s Center for Community Partnerships and Development. Vashti DuBois has held leadership positions at a number of organizations over her 30-year career in non-profit and arts administration, working primarily on issues impacting girls and women of color, including: Free Library of Philadelphia, Tree House Books, the Historic Church of the Advocate, Children’s Art Carnival in New York City, Haymarket People’s Fund in Boston, Congreso Girls Center, and The Leeway Foundation. DuBois is a graduate of Wesleyan University, and a NAMAC Fellow. She is currently working on a book about the making of The Colored Girls Museum. Launched in 2015, The Colored Girls Museum (TCGM) “honors the stories, experiences, and history of Colored Girls of the african diaspora.” It is the first institution of its kind, offering visitors a multi-disciplinary experience of memoir, in all its variety, in a residential space. This museum initiates the “ordinary” object — submitted by the colored girl herself, as representative of an aspect of her story and personal history which she finds meaningful; her object embodies her experience and expression of being a Colored Girl. TCGM has been engineered to pop up in other cities and neighborhoods around the country — transforming ordinary spaces into Colored Girls Museum outposts, which collect, archive, and share the stories of indigenous colored girls. This start-up Museum enterprise has been written about in the Smithsonian Magazine, Essence, Associated Press, Philadelphia Inquirer, Metro U.K., and others. Applicants should submit a short statement, resume and up to five work samples (including images, audio files or short texts). All submitted work must be available and ready for exhibition. Selected artists need to provide installation-ready work, along with accompanying instructions (if you are unable to install your own artwork) and any specialty hardware beyond common installation materials (nails, screws). Our inventory of audio-visual equipment (monitors, projectors and media-players) and exhibition furniture (pedestals, vitrines, shelves) are also available on an as-needed basis. Vox Populi will exercise the same care in respect to loans as it does in safekeeping its own property. We urge you to consider the DIY and high traffic nature of Vox Populi’s exhibition and event environment. All accepted artists will be asked to complete a loan form outlining additional terms and conditions, as well as further details on artwork insurance. Vox takes no commissions for sales of artwork. Inquiries will be directed to contact the artist. Works will be insured in line with Vox Populi’s policy and conditions while at the gallery for the duration of the exhibition. More details will be outlined in the loan form sent to you upon acceptance into the exhibition. Additional insurance, including during transit, is the responsibility of the artist. We urge you to consider the high-traffic, DIY nature of Vox’s exhibition environment when selecting works for submission. Unframed artworks will not be insured. Artists are responsible for shipping artwork (or delivery and pick-up) to and from Vox Populi according to the calendar above. All work MUST be received ready for installation with proper hanging devices ATTACHED and thorough instructions when necessary. Vox Populi reserves the right to photograph accepted works for publicity and educational purposes. Vox Populi reserves the right to reject works that differ from submitted images. Vox Populi is not responsible for works remaining at the gallery after the pick-up date has passed.